When you read a book like Safe Rider the 2nd in the Lost Saxons Series you must ask yourself, what isn’t there to like about it. I mean the characters are real, they must overcome real life situations and they teach you how to do that through Jessica’s words. Liv is a powerful female character that you root for and are so proud of. She got out of a bad place and is learning about herself and how to become stronger for herself and her future. It is not easy and you get a deeper understanding of how truly hard it was to get away from her past. Dean is a strong alpha male with a heart of gold and you want to bring him to life! He is real and feels deeply and his family is the Lost Saxons. You get to know a little more about how and what an MC life can be for the people in it and around it. Family isn’t always blood. Bringing these two characters to life in the words of this book must have taken a lot of heart and deep love for them to get them just right. They are perfect in their imperfections and their feelings about themselves and their lives and each other is something to be admired and treasured. I loved the first in the series, Snared Rider but in a way different as the stories were different. The commonality with the books is that they pull strongly at your heartstrings, make you tear up and maybe even cry a little and you even get to laugh. There is also an element of suspense to it and you do get closure to the immediate plot but you are left with OMG for the next book. I sure do hope Jessica doesn’t keep us waiting for long for the next book. This story interweaves with Logan and Beth's story from Snared Rider, but it's not a retread. Olivia and Dean's story expands the stalker plot from Snared Rider and provides a lot of backstory for the wonderful supporting characters (I'm rooting for Jem to get his own story!). I loved the depth of the main characters. Olivia's fear of her abusive ex-husband is throat-grippingingly, stomach-churningingly realistic. Dean takes the time to woo her and get her past her fear of men, which is a refreshing change from stories where the alpha male just sweeps in and fixes all the heroine's woes with his manly presence. The elements I loved from Snared Rider: the uniquely British feel of the MC, the hopelessness of the colliery-town setting and the realistic dialogue were all here, adding to the strengths of this story. I'm really looking forward to the next book in this series! 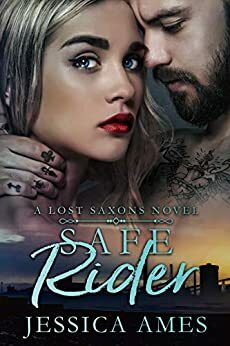 I adored this story...again book two from Lost Saxons MC is about finding yourself, learning to trust someone after you have been lost. This is Dean and Olivia's story by Liv's POV. Since I read book one this story is before book one, during and after. If you havent read book one Snared Rider, you could read this story by after you read Safe Rider you will want to read the first one. This story does not revolve around the MC. Author gives us different scenes with some of the MC characters but this story is about Liv and Dean. I love Dean , I wanted his POV. It would of been interesting to get his POV when he was apart from Liv. Overall it's a good story and Dean is added to my list of book boyfriends. Happy Reading!! slowly Dean is able to chisel down the carefully built wall that surrounds her heart. I can’t wait to read more from this very talented author!! 5.0 out of 5 starsMore pretty Please!! !